Gov. Jerry Brown signed a bill absolving adults from being required to wear helmets on electric scooters on city streets. Dockless vehicle company Bird backed the no-helmet law, AB 2989, which also permits scooters to be on streets with speed limits up to 35 mph. State law currently bans scooters on streets with speed limits exceeding 25 mph. Californians riding electric scooters will no longer be required to wear helmets, thanks to a bill signed into law by Governor Jerry Brown Wednesday. It will take effect January 1, 2019. Under the new state law, only riders under the age of 18 will be required to don a helmet (though most dockless scooter companies prohibit riders under the age of 18). The new legislation updates statewide rules for the vehicles, but leaves room for communities to impose stricter safety standards. It’s unclear whether officials in Los Angeles will move to require helmets in the city. The helmet thing was never going to work. People don't carry helmets on themselves. SANDAG and its iCommute program are encouraging all San Diego residents to use public transit and ride-hailing services during Rideshare Week, which includes Free Ride Day on Oct. 2. Because no bike share companies were available? 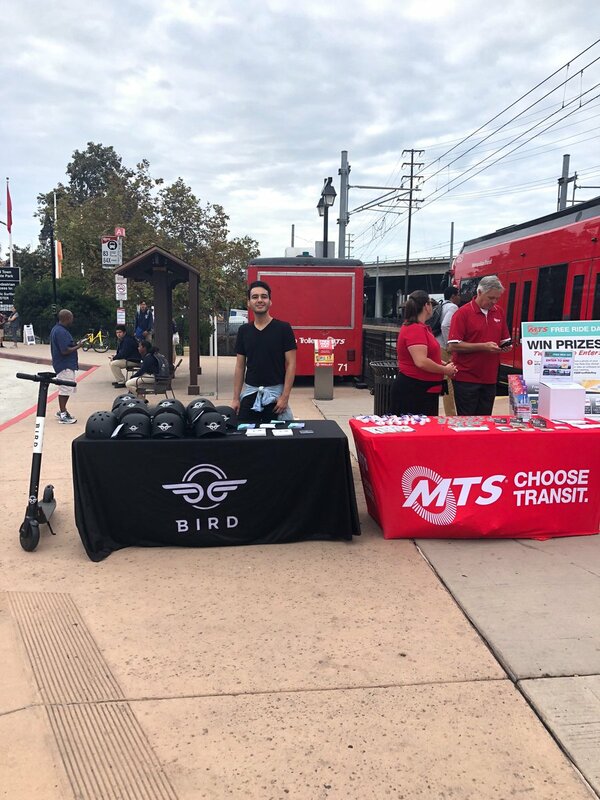 We’re celebrating Free Transit Day with @SDMTS at the Old Town Transit Center where we’ll be giving away free helmets and a free ride code! You know there is going to be a little Lynyrd Skynyrd posted shortly! Last week as a scooter rider approached a group of pedestrians blocking the access ramp on the sidewalk, I heard the scooter rider gently announce a soft road runner esque "mheep, mheep". Seems pedestrians are often surprised by passing scooters, would something as simple as a bell help reduce conflict? For example, MTB's often use trail bells as a friendly warning to hikers of approaching bicycles and I use a group of jingle bells secured to a strap over my handlebar stem to warn pedestrians of my approach on bike paths/lanes. Spurcycle's (bells) service is extraordinary. I had one of the original, Kickstarter bells and the volume had decreased over time. They told me that the rubber parts had been improved and shipped me the new parts gratis. Works great. I do like the TIMBER Bell's approach though. That might be the trick for scooters. Max Shenk of San Diego Fly Rides updated the board on the continuing progress made on branded La Jolla bike racks. San Diego plans to crack down on local Segway tour operators following a $1.7 million injury settlement in June and another lawsuit filed last spring claiming a protruding sidewalk caused the death of a Segway rider two years ago, it was reported Wednesday. An ordinance proposed by city officials would require Segway tour companies to apply for special permits, follow safety procedures and obtain commercial liability insurance of at least $2 million per case and $4 million per year, the San Diego Union-Tribune reported. In the case that led to the $1.7 million settlement, the tour company that rented out the Segway didn’t contribute to the payout because it didn’t have liability insurance and the company’s owner had limited assets, according to the Union-Tribune. In order to make sure the city’s new law would also apply to competitors, it refers to the vehicles as “electronic assistive personal mobility devices,” the Union-Tribune reported. The new law would not apply to the electric scooters that have become increasingly popular in San Diego this year, according to the Union-Tribune. City officials are exploring separate legislation for those devices. San Diego Mayor Kevin Faulconer announced a suite of proposed regulations Thursday intended to improve dockless scooter safety and education. The regulations would require dockless scooter companies to limit the maximum speed of scooters in certain areas of the city, give monthly data reports to the city including data on things like reported incidents and trip information and educate scooter riders on local and state traffic laws as well as the cost of being cited for violating relevant laws. The companies would also have to indemnify the city from liability claims in the event a scooter rider is injured within city limits and obtain a permit from the city with accompanying operational fees. 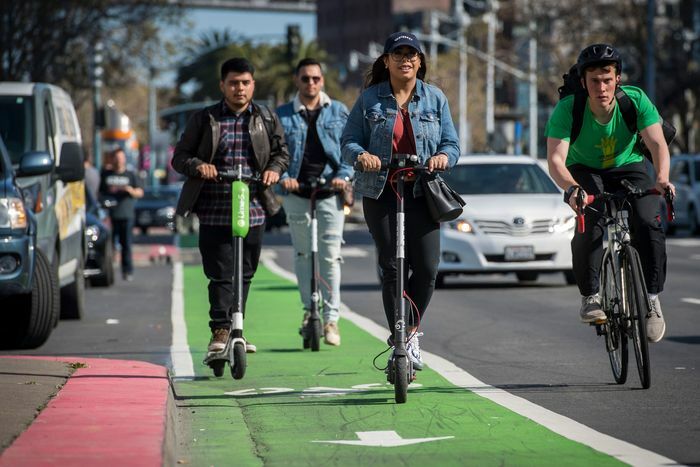 Scooter companies such as Lime, Bird and Razor would have to use geofencing technology to limit scooter speeds to 8 mph in the city’s high- traffic zones like the San Diego Convention Center promenade, Balboa Park, NTC Park and the Embarcadero downtown. Currently, dockless scooters can reach speeds up to roughly 15 mph. The City Council’s Public Safety and Livable Neighborhoods Committee plans to discuss the proposed regulations at its 9 a.m. meeting on Oct. 24. Razor upped the ante in the San Diego dockless scooter wars last week with the introduction of a model having both a seat and basket. The Cerritos-based company said its Razor Share EcoSmart was designed for long rides and errands. It has a large, padded seat and front-mounted basket. The new model can travel up to 15 mph and has a hand-operated rear disk brake for safety. When asked, "What changes would encourage you to use e-scooters more often? ", 58 percent said they wanted "more e-scooters available," 44 percent responded wanted "safer places to ride (e.g. bike lanes or paths separated from vehicles)" and 9 percent were irredeemable dorks who want "e-scooters with seats." And of course, I represent the 9 percent.. 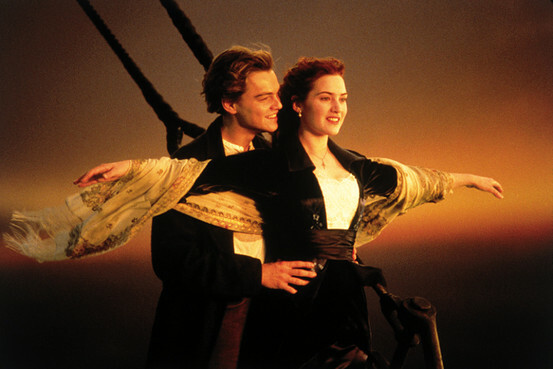 I feel like I'm flying! The San Diego City Council’s Public Safety and Livable Neighborhoods Committee unanimously voted Wednesday to send a suite of proposed regulations on dockless scooters to the full council. 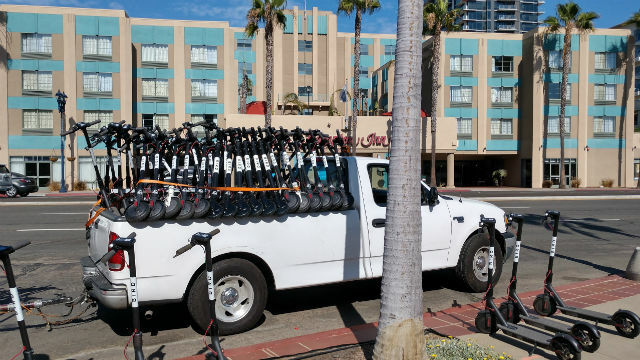 Mayor Kevin Faulconer introduced the regulations Oct. 18 after the city spent months wrestling with how to both ensure public safety and allow dockless scooter companies like Bird, Lime and Razor to continue operating in San Diego. Faulconer’s proposal would mandate that scooter companies limit the maximum speed of scooters in high-traffic areas of the city, send monthly data reports to the city detailing things like parking and trip information, educate riders on local traffic laws, and indemnify the city for liability for riders injured within city limits. The companies would also have to obtain an annual permit and pay associated operational fees. Residents voiced their opposition to the scooters at both the committee session and a meeting of the full City Council last month, when representatives from the three companies reported on ways they’re attempting to make the scooters safer to use in busy areas. One part of the proposal by both Faulconer and the scooter companies is using the GPS information on each scooter to limit speeds from 15 mph to 8 mph in areas like Balboa Park, the downtown embarcadero and various boardwalks in Mission Beach, Pacific Beach and La Jolla. This “geofencing” technology has been available for roughly six weeks, according to a Bird spokesman, and is already being implemented on the Santa Monica Beach Bike Path. Zapf proposed a ban on the use of scooters on city boardwalks last spring, but the City Council voted against the proposal, 6-3. So ask not whether scooters are safe enough for your city, but whether your city is safe enough for people to get around in without the need for armor. “If it was one (Bird) that I was after, I would just ask them (police officers) if I could grab another one and swap one in its place,” Sam said. Sam, a Bird mechanic and charger, was picking up Bird scooters on F Street and loading them in the back of his Jeep a few blocks away from where the bomb-scare happened on 600 B Street. “I’m not hating on the way people are using the Birds,” he said. “I think it’s great that the police used the scooters [earlier],” Christine said, “the homeless use them for tent [frames] like the police did with the tape.” Christine owns a coffee-cart business in front of the U-T building and was about 12 feet away from five Birds on the sidewalk. “Recently when I just got on a Bird, I was immediately pulled over and I got a $238 ticket for being on the sidewalk right here,” said Antoinette as she ordered a latte. 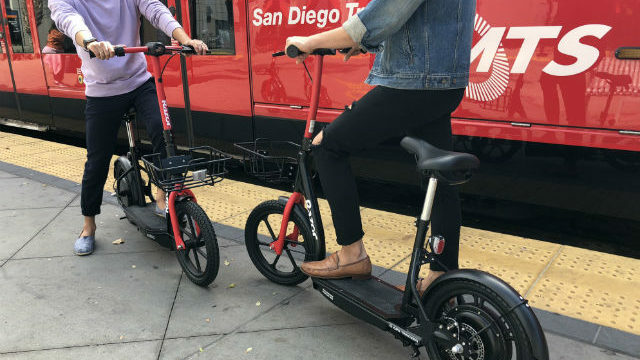 Community planners vetting the issue on Oct. 24 followed unanimous approval that day of a City Council committee’s endorsement of Mayor Kevin Faulconer’s proposed new regulations of dockless scooters. “Scooter companies are using our infrastructure and not paying for anything,” contended Beckett, who’s been documenting widespread law violations by local scooter riders. “Each scooter should have a license plate, and riders should be required to scan their driver’s license each time they ride to prevent use by underage riders” (Bird scooter riders are required to scan their driver’s licenses). Becket issued a handout with a laundry list of suggestions for new scooter regulations that included: cost-recovery fees from companies to provide law enforcement; company fees for bike/scooter lane development and maintenance; citations and fines for adults unlocking scooters for underage riders; and citations/fines for scooter companies whose vehicles block ADA ramps, sidewalks, businesses or private property. The Pacific Beach Planning Group focused on transportation issues at its Oct. 24 meeting at the PB Library. These included community concerns about electric scooters and future bus routes and connections to the Mid-Coast Trolley. Eve Anderson, chair of the Streets & Sidewalks subcommittee, presented two letters about electric scooters for discussion and approval: one to Mayor Kevin Faulconer and the San Diego City Council listing the concerns of Pacific Beach residents and another responding to the Mayor's recent proposal for regulation of electric scooters. (The Dockless Scooters Regulatory Framework was presented at the Oct. 22 City Council meeting after the Council agreed to re-address the issue.) The letters were drafted after Anderson's Oct. 10 subcommittee meeting. Normally about 10 people attend these meetings, but this one drew three times that number, Anderson reported. It included the community manager of Bird scooters and three representatives of the San Diego Police Department's Northern Division. "I've never seen an issue affect so many people," Anderson said. "The main concern is public safety, as many scooter-riders ignore speeding and traffic regulations, use sidewalks, double up, lack a driver's license, and leave scooters in areas where they can block traffic or cause harm." 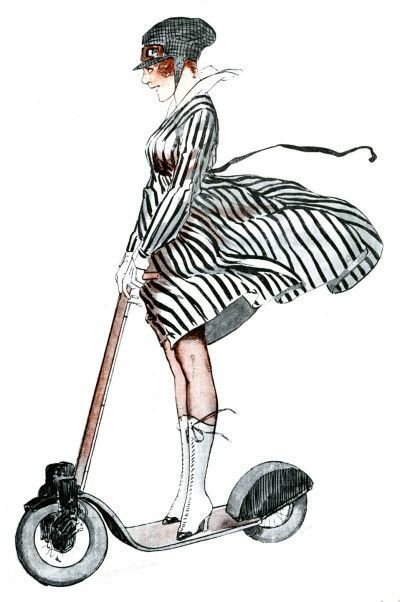 She added that since the beginning of the year, Northern Division has issued 1,660 citations for riding electric scooters without a helmet (required for those under age 18) and 1,774 total citations for other reasons. The Planning Group voted to approve both letters, the first listing concerns, and the second with added suggestions for improving the Mayor's proposed regulations. The proposed regulations focus on five areas: limiting speed, City indemnification, rider education, data sharing and operational fees. The Planning Group suggested adding way-finding signage and mobility infrastructure. The Planning Group would also like to see more designated parking areas, the use of technology to limit speed and unsafe parking, more data sharing with the scooter companies, stricter enforcement and more wide-ranging fees (such as an annual ministerial permit fee and a per-device fee). Responding to growing complaints about safety, the Mayor's proposal limits scooter speeds in high-traffic areas (such as the Mission Beach and Pacific Beach boardwalks) to 8 mph and calls for increased use of geo-fencing to prohibit unsafe scooter parking. The proposed framework, including feedback from community planning groups, will be considered by the City Council early next year. Pedestrian, Bicycle, and Traffic Safety Issues: If you find a problem on our roads that needs immediate attention, a pothole or to request street maintenance, report it to the City Services via the City of San Diego “Get it Done” App, or by calling 619-527-7500. Report a problem with a rideshare bicycle or scooter to the responsible company. “Postmen on scooters in Washington DC, 1917”. They didn’t seem fazed at all with the cars whizzing by them. On November 12, Steve Paen saw a photo of two people riding Lime scooters on the Coronado Bridge; he wasn’t impressed; he’s seen this before. “These riders were heading into Coronado,” he said. Last month, Paen who works at McP’s Irish Pub on the island, saw a larger group of motorized scooters on the two mile long bridge. “I wish I would’ve been able to snag a picture,” he said, “but I was just trying to abide the ‘hands-free’ law while driving. On October 4 at around 10 as I was heading into work, I saw what looked like seven or eight kids riding Lime scooters down the Coronado Bridge in the slow lane and heading inbound to the island. They didn’t seem fazed at all with the cars whizzing by them. I can only imagine the max speed on those things is 15 mph, but put against me traveling at 55-60 mph: it’s not very safe for both the scooter gang and [us drivers] having to share the freeway.” Paen added that the “teenagers” weren’t wearing helmets, mandatory in California for anyone operating motorized scooters under 18. Michael, an avid scooter rider, saw the photos of the the two Lime scooters on the bridge. “They [probably] got on from Cesar E. Chavez Parkway before it hits Logan Avenue (by Chicano Park),” he said. According to the Department of Motor Vehicles website: “On roads without bicycle lanes, motorized scooters may operate where the speed limit is 25 mph or less.” …. but the speed limit on the Coronado Bridge is 55 mph, and there are no bike lanes. Despite the fast failures of bike sharing companies in San Diego, which suffered from the exuberant embrace of electric scooters in their stead, it seems the city is getting yet another e-bike player. And this one has stability on its side. Uber announced Monday it is rolling out a fleet of electric bikes throughout San Diego called Jump. 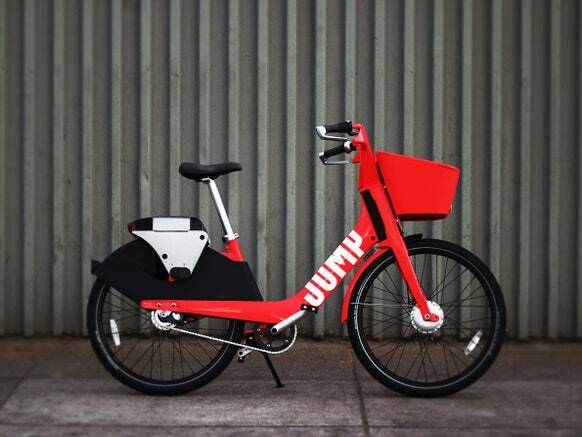 These bright red bikes come equipped with baskets and give users an electric boost while they pedal, letting cyclists travel up to 20 miles per hour without breaking a sweat. Uber is deploying 300 of these bikes across a 28 square-mile radius, largely concentrated in the beach communities and downtown San Diego. The company plans to ramp that up if demand warrants it, eventually expanding its service area to 95 square-miles by the end of the year. To help spur adoption, the company is offering free trips locally from now until Dec. 9. After that, they’ll cost $1 to unlock and 10 cents per minute to ride. “We think that this success will carry over into San Diego, not only because of the city’s topography and favorable climate, but also because of the large number of tourists who need affordable and easy ways to get around there,” Egziabher said. Plus, they’ve got an advantage over other competitors, he said. “Our riders are already familiar with Uber, and can access a wide range of transportation options right from the app.” Egziabher said Uber’s planning on rolling out e-scooters in San Diego in the near future. Uber’s Egziabher said the company did not need a permit to operate in the city, but that the company has been “working with the mayor’s office and city council throughout the development of their permit process.” “We are looking forward to continuing to work with the city on the development of, and compliance with, local regulatory priorities,” he said. Now you can find and rent an electric bike using your Uber app. Select Bike, and enjoy the ride. Move through traffic faster, easily ride up hills, and reach your destination without breaking a sweat. The first rules to address mounting problems created by the explosive growth of dockless electronic scooter rentals (operated by companies like Bird and Lime) cleared the City Council's Public Safety & Livable Neighborhoods Committee last month. Yet to hear the discussion on e-scooters at the Pacific Beach Town Council meeting Oct. 17, regulations can't come fast enough or go far enough for the residents who've been most impacted by the contraptions since their launch in PB earlier this year. 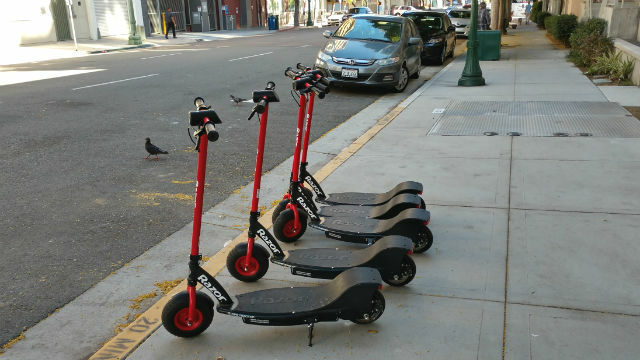 Despite a last-minute cancellation by Bird representative Sophie Beckerman, officials from San Diego Police , Lifeguards and the City Attorney's office were on hand to take questions, but admitted that efforts to control the scooters can't keep up with their meteoric rise. "Unfortunately, all we can do right now is provide as much enforcement as we can with our limited resources," said Police Lt. Steven Waldheim of the Northern Division. "But problems have just been ongoing." Waldheim noted that almost 1,700 of the citations in the beach area and boardwalk were for riding without a helmet, a restriction set to be lifted next year with the passage of a recent state law. Other violations cited were riding on the sidewalk in the business district, riding with a passenger and not having a driver's license. Lifeguard Lt. Rick Romero said his PB unit has been called to about 100 incidents of e-scooter accidents and many resulted in injuries that run the gamut. "Abrasions, people getting knocked down, knocking other people down on the Boardwalk to serious trauma, head trauma, being transported to the hospital. It's all ranges," he said. The Mineta Transportation Institute at San Jose State University is out with a study likely to gladden the hearts of San Diego e-scooter riders, plagued by a rash of accidents and beset by neighbors angered by cluttered sidewalks. “Of the 530 e-scooters MTI researchers observed and photographed in downtown San Jose, 97% were well-parked,” according to the November 14 report. "They lit one of my piñatas on fire." About two weeks ago I was driving eastbound on University Avenue in Cherokee Point. I noticed two teens riding Bird scooters on the sidewalk traveling in the same direction and as they passed Noelia’s Party Boutique by 37th, one teen punched the hanging piñatas sending one crashing down. “Since this scooter stuff started, there’s a lot of problems here. When the Bird chargers stop by and they put four-to-five scooters there in front of my store — the kids drive by and [knock] them down when they pass by [riding their own scooters]. I don’t understand why the police does not regulate on them. “This [bullying] is going to continue if the police doesn’t do anything,” Noelia said. Too many negative vibes from non-users: Let's have the people who actually use the scooters decide if they should be subjected to stricter regulation or not (saying this only partially tongue-in-cheek - after all, motorists get to decide enforceable speed limits). Maybe we just need magic carpets? Be free from traffic. Be free from pollution. Be free.